he was working for a Tea Plantation Company in South India and at the same time made it as an opportunity to evangelise the whole labour Tribal Community of the Plantation area, Visiting the interior places of the Tea Plantation Estates in the e venings and Weekends and conducted open air crusades & Gospel meetings time to time to proclaim the Gospel of Christ, which yielded fruitful results. In 1996, the Lord spoke to him to quit his secular job to step into the full time mission work. Obeying His divine call, he has resigned his secular job and moved to a small village Called Kalveerampalayam in west zone of Coimbatore near Maruthamalai Hills, which is a Hindu dominated area and founded this ministry called “EDRO MISSION INDIA” with his beloved wife & 2 lovely children, and faithfully carrying out the Lord’s Commission in India and abroad through Various Mission activities to make disciples to our Lord & Savior Jesus Christ. He has been consecrated as the ASSOCIATE BISHOP OF INDIAN NATIONAL APOSTOLIC DIOCESE, Coimbatore in the year 2012. 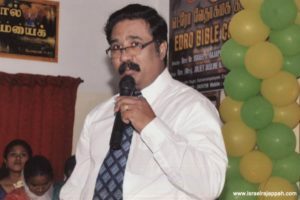 Rev.Dr.Israel J.RAJAPPAH, is holding a Master’s degree in Sociology in a recognised university in Tamilnadu. Besides, he is holding Theological degrees such as Master of Ministry, Master of Divinity and also Doctor of Divinity. He is married to Rev. (Mrs) JULIET J.RAJAPPAH, Who is dynamic spirit filled gifted servant of God and blessed with 2 lovely children namely Dr.(Miss) MARVEL REVIVALINE & Master.JOHN DIVINESON ISRAEL. Born in a God fearing family as the youngest child to her parents Pastor (Mrs).Juliet Jasline Rajappah, was raised up in an orphanage in Hindustan Bible Institute, Chennai. She accepted the Lord Jesus Christ as her Savior and had committed her life for Him, since she was 8 yrs of age. After Completing her Schooling she joined in YOUTH WITH A MISSION ORGANISATION, to undergo her Discipleship Training Course at the age of 17. Soon after the course she joined to work and minister among children with Bible Center Ministries and Ministered in Various Schools & College among the Children and teaching staff, turning young souls for Christ and started ministering in Churches among youth & women at the age of 19. She is married to Bishop Dr.Israel J.Rajappah, in 1991 and moved to Valparai Tea Estates to serve the Lord. 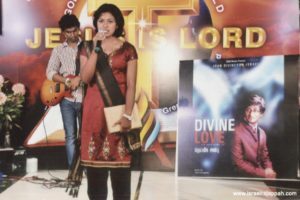 Supporting him in the Gospel Outreach Ministry and Church Services and Fasting Prayers, All night prayers etc., She is a wonderful singer too and has composed and sang many Christian Melody Songs, Which was published in Audio Cassettes & CDs which revived many souls in the Lord. 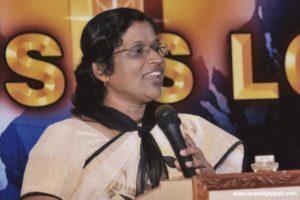 She has been Ordained as a Senior Pastor Of EPHPHATHA CHURCH OF DIVINE, Coimbatore in the year 1996 and she is mightily used by the almighty God in preaching, teaching & worship etc., and leading the mission with much sincerity& ableness in India & Overseas. She also takes care of Divine Nursery and Primary School with much love & Tender care. She is specially gifted in teaching the children and handling them with at most care. 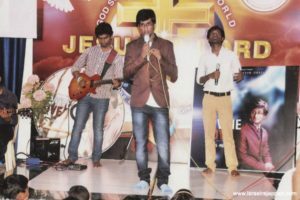 The Lord has given her a special vision to encourage & edify the women which led her to start a “Ladies Ministry” by name ARISE & THRUSH, Which is a unit of EDRO Mission India. The Lord is using her as mighty force to raise an army for Him. Dr.(Miss) MARVEL REVIVALINE, D/o. Bishop Israel and Rev (Mrs) JULIET RAJAPPAH, is a pillar of support for the mission. Being a Dentist by profession she actively takes part in the mission works. She takes charge of the youth and Sunday school ministries and handle them effectively. Being an anointed instrument of God, she shares the Gospel & teach the word of God to the church congregation to edify the church and to help them to grow in the grace and knowledge of God, in various prayer meets. She has got a future vision of extending the mission’s work into Health Care & Hospital Sectors.